Eduardo Paolozzi’s General Dynamic F.U.N. From across the ocean, British Pop artist Eduardo Paolozzi (1924–2005) absorbed American popular culture with delight and dismay. His 1970 portfolio of screenprints and photolithographs General Dynamic F.U.N. featured 50 dizzying images drawn from the artist’s personal collection of American magazines and comics. 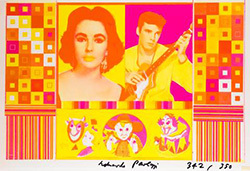 Influenced by the collage aesthetic of the Surrealist and Dada movements, Paolozzi poured iconic images of 1960s America—Liz Taylor, television sets, robots, motorcycles, Mickey Mouse and Mr. Peanut—into the blender of his unconscious mind and set it to spin. This exhibition is presented in honor of the Averell Council of the Memorial Art Gallery. Pictured: An Empire of Silly Statistics… A Fake War for Public Relations.